Today, ahead of the one-year anniversary of the introduction of the Equality Act, HRC announced that Adobe Systems Inc., Advanced Micro Devices Inc., Alcoa Inc., Automatic Data Processing Inc., Bank of America Corp., Booz Allen Hamilton Inc., Cargill Inc., Chevron Corp., Cisco Systems Inc., Darden Restaurants Inc., Delhaize America Inc., InterContinental Hotels Group Americas, JPMorgan Chase & Co., Kenneth Cole Productions Inc., Pure Storage Inc., TIAA, Uber Technologies Inc., WhiteWave Foods Co., Williams-Sonoma Inc., Xerox Corp., and Office Depot Inc. have joined HRC’s Business Coalition for the Equality Act. Now including more than 80 major employers, the complete list of coalition members that have officially endorsed the bipartisan Equality Act can be found below. Introduced one year ago tomorrow -- one month after the historic Supreme Court marriage equality ruling in Obergefell v. Hodges -- the Equality Act would finally guarantee explicit, permanent protections for LGBTQ people under our existing civil rights laws. It would provide clear, permanent, and equal protections under federal law for all Americans in vital areas of life, like employment, access to public spaces, housing, credit, education, jury service, and federally-funded programs. Discrimination is a real and persistent problem for too many LGBTQ Americans. HRC polling has found that nearly two-thirds of self-identified LGBTQ Americans report experiencing discrimination -- including people like Carter Brown, a transgender man who lost his job after he was outed by his colleagues. Currently, 50 percent of LGBTQ Americans live in states where they are at risk of being fired, denied housing, or refused service because of who they are. There is no federal law explicitly protecting LGBTQ people from discrimination, and thirty-one states still lack fully-inclusive non-discrimination protections for LGBTQ people. Polling released this year by the nonpartisan Public Religion Research Institute (PRRI) found that support for a bill like the Equality Act topped 70 percent nationally, including a majority of Democrats, Republicans and Independents. PRRI’s groundbreaking survey included 42,000 interviews in 50 states and found majority support for the Equality Act in all 50 states. Hillary Clinton has called the Equality Act her “highest priority,” while in contrast, Donald Trump has pledged to sign a bill that would put LGBTQ people at even greater risk of discrimination nationwide. 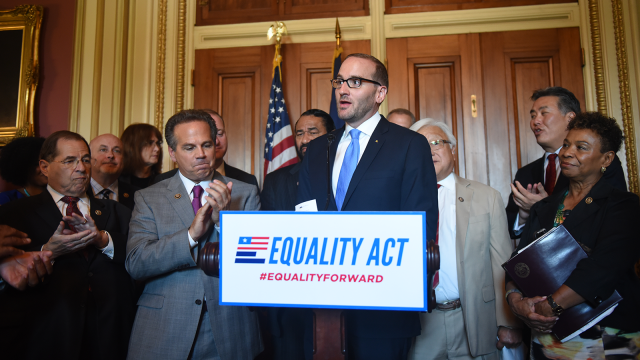 Now co-sponsored by 218 members of Congress, the Equality Act was introduced last year by Senators Jeff Merkley (D-OR), Tammy Baldwin (D-WI) and Cory Booker (D-NJ); and Representatives David Cicilline (D-RI) and John Lewis (D-GA). The measure also has bipartisan support, including from Senator Mark Kirk (R-IL) and Representative Bob Dold (R-IL). HRC first launched the Business Coalition for the Equality Act in March of this year. With combined operations in all 50 states, headquarters spanning 23 states, and $2.6 trillion in revenue, the companies that now make up the coalition employ over 5.6 million people in the United States.